Tomorrow, I'm visiting a small local garden, the owners have a collection of different Snowdrop varieties. They may be common, but we still love them.....did you buy any from your visit today? Amy &Dd I didn't buy any as I've lots of these commons and common doubles and £10-30 a bulb to then get lost in my masses, well! I did like the ones with the yellow ovaries, they did look different.There were also some absolute whoppers. BJS would have appreciated the garden. I think the posh ones are a right rip off, I feel the doubles are doubly nicer than singles but all so lovely. Dawn I think your right there....... ridiculous prices! 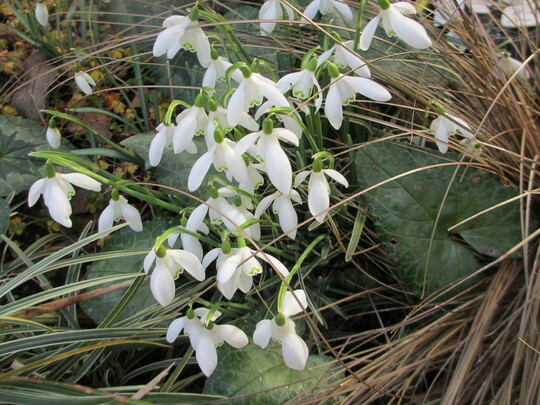 See who else is growing Galanthus nivalis (Common snowdrop).